I recently read a short article about how rodents (rats, raccoons, mice, etc.) dislike the smell of wintergreen. It went on to mention trash bags folks can purchase that are impregnated with the natural oils of wintergreen and eucalyptus. Apparently, this deters rodents from feasting on your garbage. This started me thinking if you could use the trash bags you already had and, when full, spray them with the oils mentioned. That led me to ask myself if a person could grow wintergreen and I had to question whether I had ever seen wintergreen as a nursery or garden center selection. I let my fingers do the walking and found several sites offering wintergreen including Hartmann's, Spring Hill Nursery, Seedland, and Wayside Gardens to name a few. It is grown as a ground cover typically in zones 3-8. Gaultheria procumbens prefers shade but will grow in sun once well established. The plant forms white bell-shaped flowers in the summer becoming bright red berries in late fall, lasting until June of the following year. 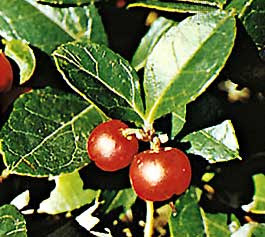 The berries contain the wintergreen oil as do the leaves. The leaves make a tea and the berries are edible. A word of caution, however. According to the CU Herb Society wintergreen oil is poisonous in large amounts and can actually be fatal to young children who drink it. They say the oil can also burn the skin although I assume you would have to slather it on like a sunscreen for that to happen. Mystery solved - you can grow wintergreen and it's widely available in more northern climes. For us down in the south, do you think wintergreen gum in the trash bag will accomplish the same thing? Happy Gardening.